Family Bingo Night! 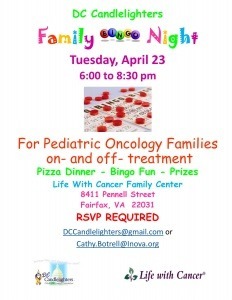 Tuesday April 23, 6-8:30 PM For Pediatric Oncology Families on- and off- treatment Pizza Dinner and Bingo fun & prizes! At the Life With Cancer Family Center The event is FULL and we can not accept additional RSVP's. 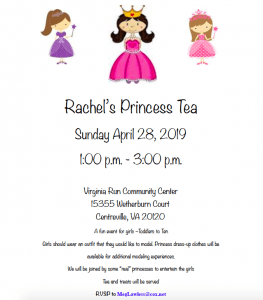 Rachel’s Princess Tea Sunday April 28, 2019 1:00 p.m. - 3:00 p.m. Virginia Run Community Center 15355 Wetherburn Court Centreville, VA 20120 A fun event for girls –Toddlers to Ten! Girls should wear an outfit that they would like to model. Princess dress-up clothes will be available for additional modeling experiences. We will be joined by some “real” princesses to entertain the girls Tea and treats will be served. RVSP to MegLawless@cox.net See all the fun from last years event!